Everyone is a geek at heart – whether you geek out about the latest Star Wars film or the new Perk Recombobulator in the online game ‘Fortnite’, we all have something we are passionate about. At NetSupport we are true geeks when it comes to technology – we love it! 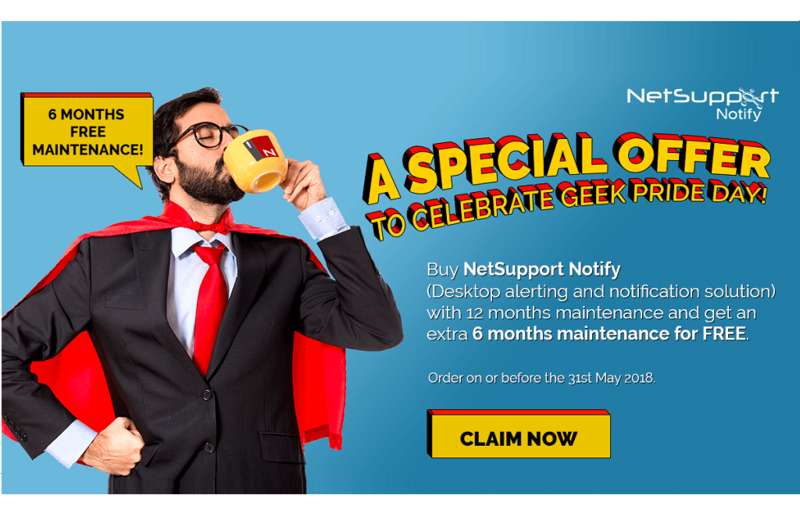 And so, to celebrate our passion for technology, we have a special Geek Pride offer… for 1 week only, if you buy NetSupport Notify with 12 months maintenance (from £1 a licence), you get an extra 6 months maintenance for FREE. NetSupport Notify is a solution specifically designed to help schools and businesses boost their communication and support their emergency and lockdown procedures. Using NetSupport Notify, organisations can deliver one-way alerts and notifications to desktop users and large information panels in halls and foyers. Alerts automatically take screen focus, meaning they can’t be hidden, ignored or saved for later. The notifications can even be targeted to select groups and scheduled for maximum impact. To claim this special offer click here. Remember to order on or before the 31st May 2018.